Will Carling OBE is a former England Rugby Captain. At the age of 22, Carling was England’s youngest Captain. He captained England for 59 Tests, winning 44 of them, and gained 72 caps – the longest-serving and also the most successful captain ever. His leadership qualities ensured England dominated the Five Nations in the first-half of the 1990’s completing Grand Slams in 1990, 1991 and 1995, plus a further Championship with Triple Crown in 1996. 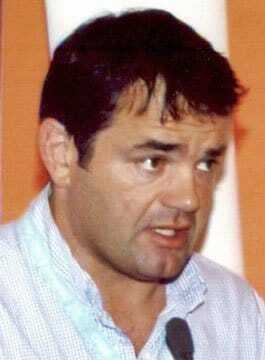 Alongside players such as Brian Moore, Jeremy Guscott and Jason Leonard, Will Carling led England to the World Cup final in 1991 and also the semi-finals four years later. The Harlequins centre was selected for the 1993 Lions Tour and played in one Test. England’s dramatic win over the touring All-Blacks in November 1993 meant that Will captained a winning team at least once against all of the world’s major rugby playing nations. 1984 – Captains England at 18-group level. 1988 – Wins first full England cap against France. Later in ’88, he became the youngest English captain in 57 years. 1989 – Unable to tour with the Lions to Australia due to a broken leg. 1990 – England lose to Scotland in Grand Slam decider at Murrayfield. 1991 – Leads England to first Grand Slam for 11 years. England lose 12- 6 to Australia in the World Cup final. 1992 – Awarded an OBE. Captains England to second Grand Slam win. 1993 – Makes Lions Test debut against New Zealand. 1994 – Breaks the world record for Test captaincy. Wins 50th England cap. 1995 – Captains England to another Grand Slam. England finish fourth in World Cup in South Africa. 1996 – Leads England to Triple Crown. Stands down as captain having led them to 46 wins in a world record 59 matches. 1997 – Wins 72nd cap for England. Announces international retirement. 1998 – Retires from rugby. Furthermore, his business career has been as impressive as his playing successes, with numerous successful ventures. From Sedbergh School and Durham University he was commissioned as Lieutenant in the Royal Regiment of Wales before moving onto a marketing post with Mobil Oil in 1988. Will Carling is in great demand as a Motivational and Rugby After-Dinner Speaker.